This book is the first comprehensive presentation of the teachings of over 120 Orthodox Saints and dozens of holy hierarchs, clergy, and theologians on the subject of the soul's exodus to the next life. 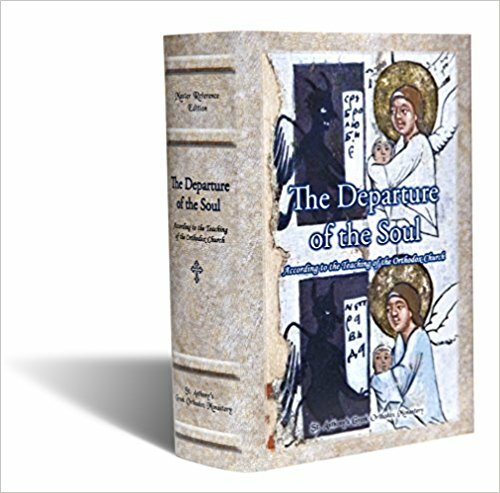 With over 750 pages of source material featuring many rare images and dozens of texts translated into English for the first time, The Departure of the Soul is unique as both the sole reference edition on the subject and a fascinating and spiritually profitable book for anyone seeking insight into one of the greatest mysteries of all. The book also reveals over 100 falsifications, misrepresentations, and errors contained in the publications of authors who oppose the teaching of the Church, thus definitively ending the 40-year controversy in the Church. The book features: ~ Full endorsements by eight Orthodox hierarchs ~ Foreword by His Eminence Metropolitan Nikolaos of Mesogaia and Lavreotiki (Church of Greece) ~ Spans the 2,000-year history of the Orthodox Church with chapters on Holy Scripture, The Liturgical Services, The Writings of the Fathers of the Church, The Lives of the Saints, Iconography, Commemoration and Prayer for the Departed and Contemporary Opponents of the Church's Teaching. Many rare images and dozens of texts translated for the first time from the original languages.